It's now Thursday on the East Coast! Give me TAR now! I will most probably not get TAR 12 for a while but we will see!!!!!!!!! 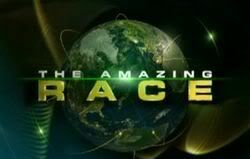 Ken, you already have TAR, specifically the Amazing Race Asia 2 Introduction of Teams show has already happened in AsiaPacific. If you want more, you won't get it until TAR12 starts on Monday night on AXN from what I understand. I'm in the US just like you.